You hear a heck of a lot talked about streaming and its impact on the music industry these days. So how much of it is worth listening to – and how much is complete hogwash? That, essentially, was the question tackled by Warner Music Group’s Chief Digital Officer and EVP of Business Development, Ole Obermann, last week at Reeperbahn Festival. Obermann (pictured, main right, with Warner Central Europe boss Bernd Dopp) presented three killer myths – and three killer truths – about the music business in the streaming age on Friday (Sept 22) at the Hamburg event. “As a major global record label we are keeping an eye on how an artist breaks or develops cross borders in this new streaming world,” said Obermann. 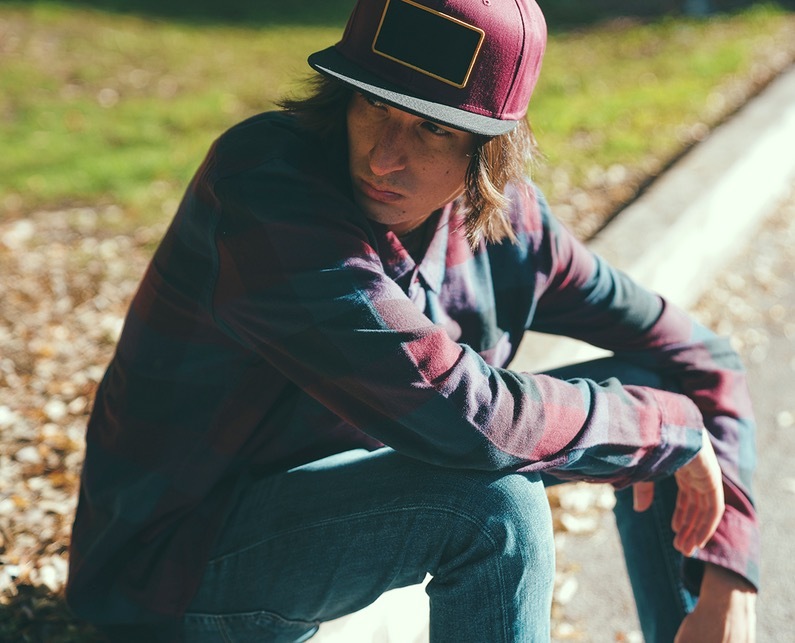 He gave three case studies to prove his point – local hero Robin Schulz, break out hip-hop star Lil Uzi Vert, and Danny Ocean (pictured inset). “Danny Ocean, a Venezuelan artist now based in Miami, signed to Warner Music Latina in the last year,” added Obermann. “His song Me Rehuso absolutely exploded within a very short period of time on streaming platforms and about 45% of the streams of this song are now coming from non-Spanish speaking markets. Obermann gave a very upbeat look at global penetration of streaming – both where the market is saturated, and also where there is a lot of potential. “The Scandinavian markets where streaming really took hold very early, some of those markets are at 60–70% household penetration in terms of streaming subscription,” he noted. “But if you look at Africa, Asia or Latin America, we are still talking 2–3% in some of those markets. “If you look at comparisons for cable or television subscription services in developed markets like Germany, US or UK, you have about 70-75% cable television penetration, whereas in Germany right now we’re at about 15% household penetration for music streaming. “So it’s easy to imagine that our streaming potential in a lot of these markets is still 5 or 6 times where we are today. 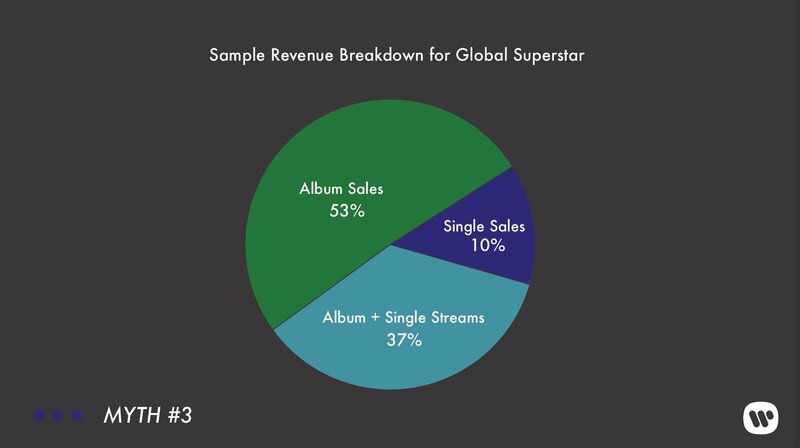 Obermann then showed a sample breakdown of revenue for a global superstar (album sales [physical and download], single sales [physical and download], and streaming) to illustrate that the full body of work – the album – is still crucially important even in today’s streaming world. It demonstrated that the artist had pulled in 50% of total recorded music income from full (ie. not equivalent) album sales. Truth #1: Video and UGC are areas of huge untapped potential. Obermann expressed hope that solving the value gap issue would unlock great opportunity for the industry, artists, and fans. “Video and user generated content are huge areas of untapped potential,” he said. “The problem that we have on this front is there is an unbelievable amount of demand for this kind of content but the revenue is really lagging right now. “That [graph, left] is the United States music video streams. We are up to a couple of hundred billion streams reported in 2016 and we started at about 5 billion back in 2011. 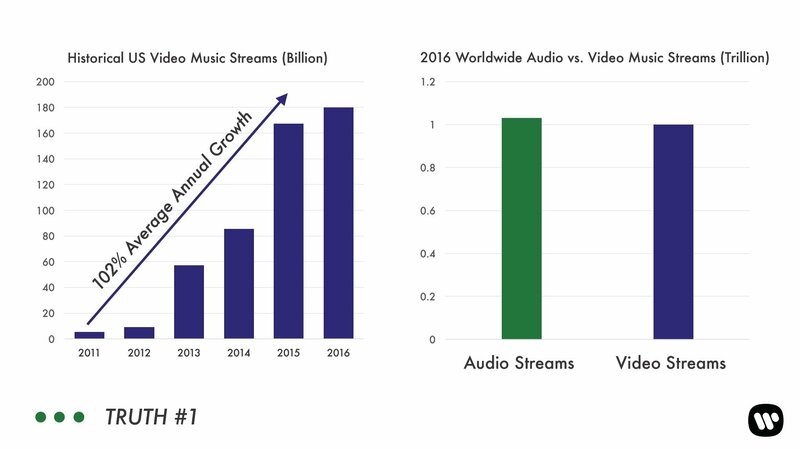 “These numbers [graph, right] are pretty staggering… in 2016 there were over a trillion on-demand audio streams and over a trillion on-demand video streams, almost identical to one another. Truth #2: Voice activation is going to dramatically change the way fans interact with music. 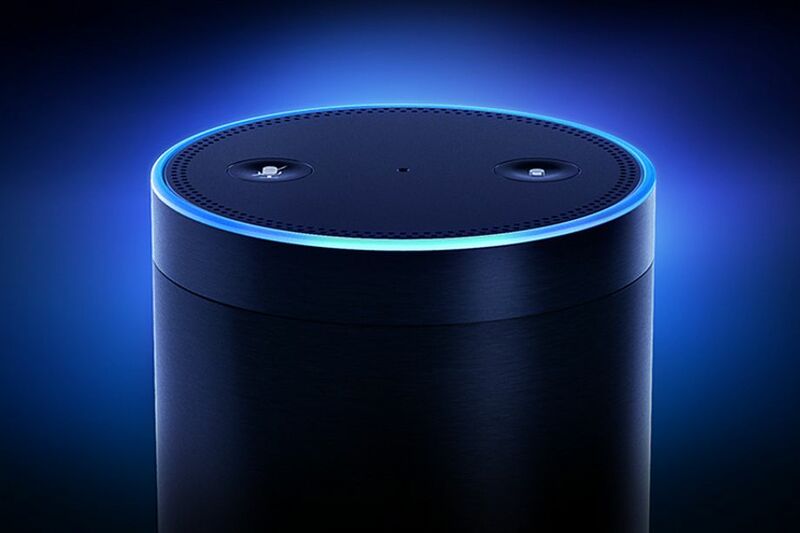 Obermann opined on the opportunity that voice activated devices present to the music industry, particularly in increasing engagement across paid subscription services – the music industry’s current sweet spot. “There are a lot of things you can do with voice activated speakers but music will always be the best use case,” he said. “One important metric we keep in mind is engagement – how many songs is the average user listening to in a month? The higher that engagement level is the more likely they are to convert from ad-supported to paid. “These speakers massively bring down any hurdles that there are to engagement because now you can be washing the dishes or reading the newspaper but you want to listen to that one track – you just say it. Truth #3: Music is now the disruptor, not the disrupted. Acknowledging the shift in the industry – from resisting technology and change – to now embracing it – Obermann expressed optimism for the future of artists, the industry – and, naturally enough, Warner Music. “I don’t think that we are out of the woods yet – we have a lot of work to do, and a lot of challenges that we still need to confront,” he said. “But there is a change in how music is looked at by our technology partners, and in the ways we are positioning ourselves with fans, and in how we work with artists. “It used to be that we were being disrupted by technology and now we actually are becoming the disruptor, because every consumer facing technology company wants to use music or music video in their service. “We are just getting started on what could be a very positive era for the music business in terms of revenue growth – but also in terms of what it means for the fan. The fan is going to have very affordable access to a massive catalogue of music, they are going to be able to take it wherever they want, discovery is going to be better than ever, and it’s going to be completely social so you can share with your friends. “If you are an artist you are going to be in a very good place – artists are some of the top trending personalities on social media, recorded music revenue is growing again, and they are crossing borders in ways they never could before which means growth in touring and merch and other ancillary revenue streams.